Slimmed down to micro size, this MIDI keyboard is ready to play. 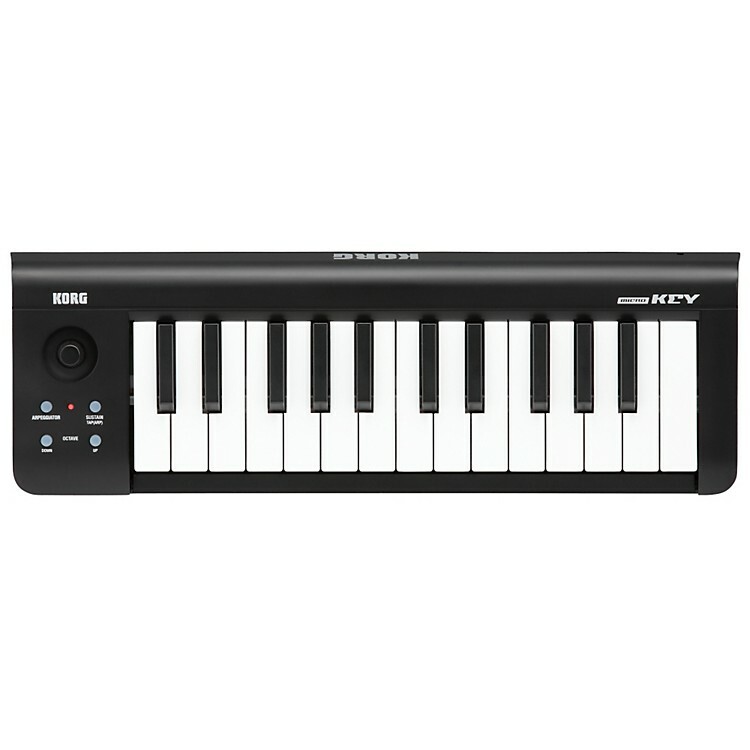 The microKEY25 features excellent portability, allowing you to enjoy playing and producing with a great-feeling keyboard even when you're away from home. It features an expressive Joystick, as traditionally found on larger controllers, and provides simultaneous control of multiple parameters at the same time, along with control of the built-in tempo-synced arpeggiator function. That's not all; the microKEY25 can be powered directly from your iPad via the Camera Connection Kit, and it can be immediately used to control MIDI-capable apps such as Korg's iMS-20. The microKEY25 also includes a download code for FREE Korg M1Le software, giving you all of the preset sounds and all of the PCM waveforms of the original M1, and a browser/search function that makes it easy to find that "perfect sound." Also included are licenses* for Applied Acoustics Systems' Strum Acoustic Session, Lounge Lizard Session, and Ultra Analog Session as well as a license for Toontrack's software drum sound module EzDrummer Lite,* and a discount coupon* for Ableton's "Live," "Live Suite," and "Live LE" DAW software, widely popular for its sophisticated functionality. 25 Keys that will ride with you anywhere, order one for your mobile rig today. microKEY 25 =0.65 Kg / 1.43lb. You can connect the microKEY25 to your iPad and use it to control apps such as the Korg iMS-20 via MIDI. (With Apple's iPad Camera Connection Kit or similar device).